Originally launched as a simple publishing platform, WordPress powers over 25% of all websites on the internet. Today, WordPress is not limited to just blogging and is being used by businesses of all sizes. Some of the most reputable brands that use WordPress are Bloomberg, Bata, Toyota, CNN and LinkedIn. 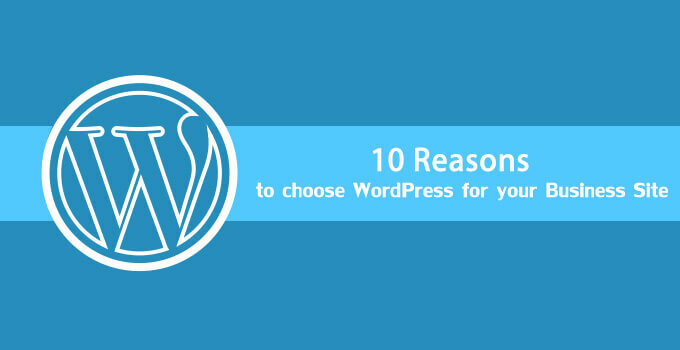 Have you ever thought why WordPress is the go-to choice for many businesses? Perhaps because it’s easy to use and highly flexible, right? But in fact, there are many other reasons that you might not be aware of! Check out the Infographic below to know why most of the businesses prefer to use WordPress over any other CMS (and why you should use it too). So, are you ready to launch your business with WordPress? Place your order right now or discuss with us if you have any queries. WordPress is an Open Source software, which means you’re allowed to use and alter the source code in any way to fit your business needs. It not only lets you take full control over your business site but also gives you the freedom to do whatever you like with the software. From software installation to site management, WordPress makes everything a breeze. Even if you're a novice, you can get your business site up and running in just a few minutes. Offering plenty of documentation, WordPress lets you do almost everything yourself without having any knowledge of coding. What makes WordPress so powerful is its theme system and plug-in architecture. With a variety of themes and plug-ins, you can make your site look and function as you like. Even in most of the cases, you don’t need to hire a professional developer to add the desired functionality to your business site. Being a content first platform, WordPress has a very SEO-friendly nature that makes it easy for search engines to crawl and index a site’s content. In fact, Google’s Matt Cutts said, “WordPress automatically solves a ton of SEO issues”. What’s more interesting is that he uses WordPress to run his personal blog. Offering thousands of free and paid themes and plug-ins, WordPress makes it easy for users to make their business site truly one of a kind. No matter what kind of business you're in, WordPress themes are available for all kinds of businesses. Best of all, they can be customized with just a few mouse clicks. Another genuine reason to use WordPress is its flawless eCommerce integration with an existing blog or website, in case you suddenly decide to sell online. With an eCommerce plug-in like WooCommerce, you can turn your ordinary website/blog into a multi-billion dollar eCommerce store, absolutely without re-designing it. You never know when you may need to collaborate with multiple persons to keep your business site up and running. So WordPress lets you assign different roles for different individuals. This way, you’re able to have a variety of contributors, which makes it relatively easier for you to manage your business site. Unlike other CMS, WordPress is fully capable of standing against today’s ultra-advanced cyber attacks. That’s because WordPress’ makers take the security very seriously and therefore constantly update the software. On the other hand, hosting platforms like Microsoft Azure and Google App Engine makes a WordPress site able to handle huge spikes in traffic. In case you get stuck somewhere, WordPress’ vibrant and supportive community is always there to help you. You can find answers to all your WordPress-related questions via WordPress Forums. To learn more about WordPress, you can read blogs posts and attend a WordCamp or Meetup. Last but certainly not least, WordPress is getting better day by day. Since the day WordPress was launched, it has been updated over 25 times. Top-notch developers hired by WordPress continuously update and improve the software to make WordPress the world’s powerful, flexible and secure CMS.